The third winter storm of the new year unleashed cold downpours across the San Diego area Monday while dusting its highest mountaintops white. In a continuation of 2019’s already blustery start, the inclement atmospheric system brought anywhere from a few hundredths of an inch to over an inch of rain across the county, along with light layers of snow on the region’s loftiest peaks, meteorologists reported. Over the 12-hour period ending at 4 p.m., according to the National Weather Service, the bands of dark clouds dropped 1.03 inches of precipitation in Julian; 0.98 at Palomar Observatory; 0.97 in Mesa Grande; 0.9 at Henshaw Dam; 0.77 on Mount Woodson; 0.74 at Skyline Ranch and in Warner Springs; 0.67 at Ramona Airport; 0.66 in Harbison Canyon; 0.63 in Ramona; 0.62 in Santee; 0.61 in Barona; 0.6 in Santa Ysabel; 0.59 on Otay Mountain; 0.58 in Escondido; 0.57 in La Mesa; 0.56 at Lake Murray and in Lemon Grove; 0.53 in Lakeside; and 0.51 at San Diego Country Estates. Other moisture tallies included 0.5 of an inch in Descanso; 0.49 at Brown Field airport and on Volcan Mountain; 0.47 in San Felipe; 0.43 in Chula Vista, San Ysidro and University Heights; 0.39 in Kearny Mesa and at Lindbergh Field; 0.38 at Montgomery Field; 0.34 in Mission Valley; 0.32 in Borrego Springs and La Jolla; 0.31 in Encinitas and Mission Beach; 0.27 in Agua Caliente and San Marcos; 0.26 in Carlsbad; 0.24 in Bonsall, Canebrake and San Onofre; 0.23 in Tierra del Sol; 0.22 in Del Mar; 0.21 in Ocotillo Wells and Solana Beach; and 0.19 in Oceanside. Due to the potential for intense cloudbursts, the weather service issued a flash-flood watch, effective through midnight in local coastal, inland-valley and mountain communities. 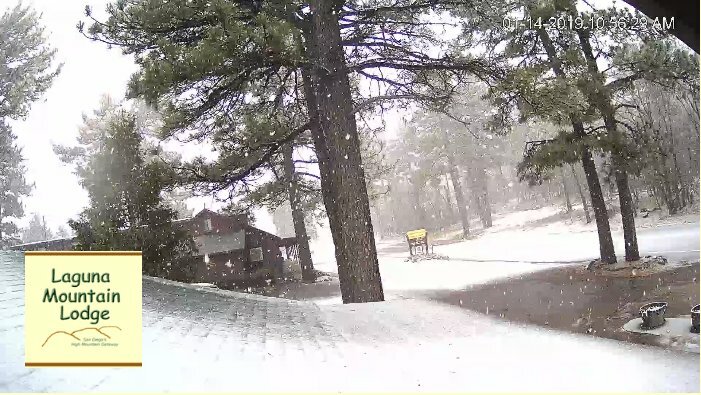 As of late Monday afternoon, an inch of snow had fallen on Mount Laguna, forecasters reported. Some locales between 5,000 and 6,000 feet were expected to see as much as 5 inches of frozen white flakes by the time the storm dissipates and moves out of the area late Monday evening. Following a brief respite, yet another round of unsettled weather and precipitation is due to hit the county Tuesday afternoon, followed by one more spell of wet weather Wednesday night into Thursday evening. Dry and warmer conditions should return Friday and prevail through next weekend, forecasters advised. Updated at 6:30 p.m. Jan. 14, 2019.